I made a quick visit to the small raised peat bog near Pont Abraham (SE Carms) this afternoon (1/5) to look at the birches and I collected a few blotch mines for further inspection. 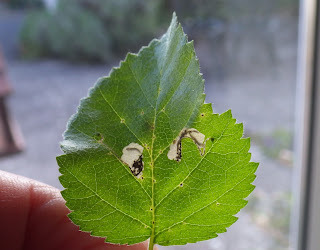 The one below looks like Eriocrania salopiella, with the mining activity in the central part of the leaf rather than at the edge. No E. sangii were seen but plenty of possible and, as yet, unconfirmed E. semipurpurella. The latter was also on birches right in front of my house, which I`d forgotten about even though they are visible to me many times daily!